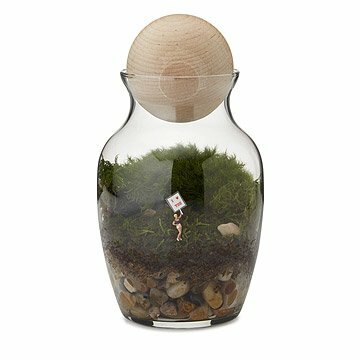 The brazen figure in this lush terrarium will be standing by to remind the one you love how much you care. Even if you can't be there to declare your adoration yourself, this tiny figure will be standing by to remind those you love how much you care. Miniature world virtuosos Michelle Inciarrano & Katy Maslow fill each glass apothecary jar with textural mosses, river stones, and rich soil, creating a beautiful, easy-care ecosystem. Each moss-filled microcosm is populated by a male or female character in your choice of skin tone who speaks to the heart with a brazen "I love you" sign. Assembled by hand in Brooklyn, New York. Jar made in China. 9" H x 5" Dia; 3 lbs. Keep in the shade and mist every 2-4 weeks. Detailed care instructions are included. It is a beautiful romantic novelty gift! I have to say it's quite overpriced but I wanted to splurge a bit this year. Considering the cost it would be nice to include a mini spritzer bottle to "water" the moss. We certainly didn't have one on hand ready to properly care for the moss. Not all husbands are alike. Mine really hated the idea I spent "that much" on such a gift but somewhat appreciated the sentiment behind it. Feedback on the female holding the sign as well. Would be great if she had a pin or something to hold her up to dig into the bottom. She just wouldn't stay where she's at. I will try to glue a toothpick and use that to keep her propped up. This product was packaged well and was still green when received. Instruction included are helpful for care. It was absolutely perfect! Lush moss and the vase is the perfect display for it. It came with great instructions so hopefully my husband will keep it alive. Valentine's Day gift for the wife that was a little outside the box and fun, went over well and she really likes it. Cute but figure was way off. I got this for my husband for Valentine's Day. I wanted the figure to look like me so I chose the blond. It said blond on the invoice. What I got was a redhead in what looked like a mechanic's outfit. My husband thought it a little weird. I was disappointed. I desperately want to love this. But I don't. When this arrived it was frozen and already dead. Uncommon goods sent us another, however the second one was only partially alive when we received it and we couldn't keep it alive. My partner is a master gardner, and I'm an average gardner, so there shouldn't have been any problem with keeping this alive. Plus, it is much smaller in person than it is in the photo. We could easily make our own terrariums that are better quality than this. All this said, the figurine inside is a cute touch and we both really like that. A most unusual terrarium, and my wife just loves to have greenery everywhere. There are a lot of seeds sprouting. Whatever they are the stems and leaves are huge. It's not all that cool to have that happen.